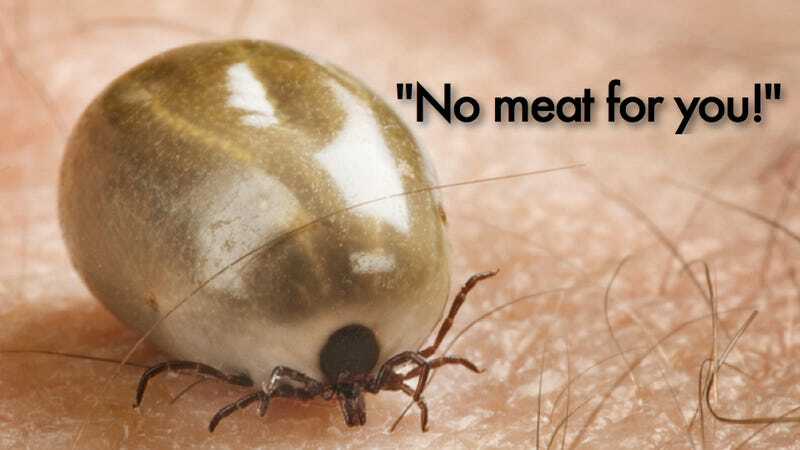 Ticks are known for transmitting disease, but they've also been known to make people deathly allergic to meat. Discover Magazine is running a really interesting post on little-known facts about allergies. The link between ticks, meat and violent allergic reactions immediately stuck out. Since 2009, immunologist Scott Commins has been studying this bizarre connection. His research reveals that tick bites can trigger the production of antibodies that target alpha-gal, a carbohydrate found in beef, pork and lamb. The next time you eat meat, your body may use these antibodies to mount a violent, self-destructive immune response more commonly known as anaphylaxis. "We've had people nearly die," Commins says. What's really chilling about all of this is there's a good chance you won't have any idea you've developed a meat allergy to begin with. After all, ticks are usually pretty benign parasites. They can carry and transmit diseases, but rarely do, so in most cases there's no cause for concern. But if your body does happen to start producing anti-alpha-gal antibodies, you won't know it until the next time you eat meat, at which point they have the potential to facilitate anaphylaxis. In any case, the next time you're walking barefoot through a field only to find a tick between your toes, remember to be careful the next time you eat meat — your body may be on a self-destruct mission to kill all alpha-gal. Check out more weird allergy facts over on Discover Magazine.